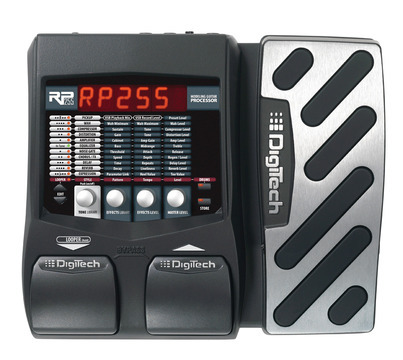 The RP255 guitar multi-effect processor gives you 94 amps, cabinets, stompboxes, and effects allowing you to get virtually any sound you want, just like the pros. With USB streaming audio and Cubase LE4, the RP255 allows you to easily record directly to your computer with sounds so good people will think that your song was recorded in a major studio. All specifications subject to change. DigiTech, X-Edit, Production Modeling, Grunge, Death Metal, Jimi Hendrix™ Artist Series Pedal, DOD, Gonkulator, DigiTech Whammy, Multi Chorus, Auto Ya, YaYa, Synth Talk, Lexicon, Johnson Amplification and AudioDNA are trademarks of Harman International Industries Inc. *Other product names modeled in this product are trademarks of their respective companies that do not endorse and are not associated or affiliated with DigiTech or Harman International Industries, Inc. ADA Flanger, Arbiter Fuzz Face, Boss CE-2 Chorus, Boss CS-2, Boss DM-2, Boss DS-1, Boss Metal Zone, Boss OC-2 Octaver, Boss OD-1, Boss SD-1, Celestion, Carvin Legacy, Demeter Fuzzulator, Dunlop Cry Baby, EH Big Muff ?, EH Electric Mistress, EH Small Clone, EH Small Stone, EMT 240 Plate, Fender Blackface Deluxe Reverb, Fender Blackface Twin Reverb, Fender Blonde Bassman, Fender Brownface Bassman, Fender Opto Tremolo, Fender Tweed Bassman, Fender Tweed Champ, Fender Tweed Deluxe, Fender Twin Reverb, Fulltone OCD Overdrive, Gibson GA-40, Guyatone Overdrive, Hiwatt, Ibanez Tube Screamer, Jensen Blue Backs, Laney Supergroup, Maestro EP-2, Marshall, Marshall JTM-45, Marshall Jump Panel, Marshall Master Volume, Marshall Super Lead, Matchless, Matchless Chieftain, Mesa/Boogie, .22 Caliber, Mark II, Mark IV, Dual Rectifier, Triple Rectifier, MXR, MXR Distortion +, MXR DynaComp, MXR Flanger, MXR Phase 100, Orange OR120, Peavey 5150, ProCo Rat, Randall HT-100, Roger Mayer Octavia, Roland JC-120, Soldano, Sunn 100S, TC Electronic Chorus, Unicord Uni-Vibe, VHT Amplification, Voodoo Labs Analog Chorus, Voodoo Labs Sparkle Drive, Vox, Vox Bias Tremolo, Vox Clyde McCoy Wah, and Vox Top Boost are trademarks or trade names of other manufacturers and were used merely to identify products whose sounds were reviewed in the creation of this product. All other trademarks are the property of their respective holders.